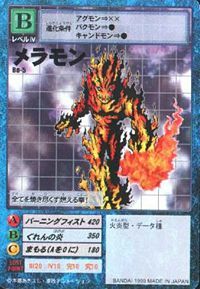 A Flame Digimon whose entire body is shrouded in crimson flames. 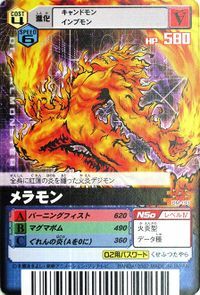 As a Digimon generated from the defensive "Firewall" which prevents illegal entries from the Internet and the like, it possesses a violent temperament like the flames that envelop its body, and tries to incinerate everything it touches. 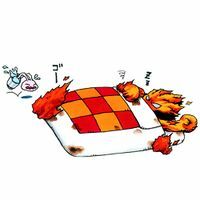 Its fire power is stronger than those of the same species on File Island, and because taming this Digimon is extremely difficult, even if it's tamed, there's no telling when it will bare its fangs. 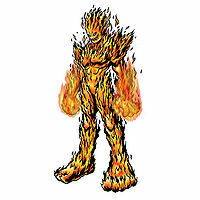 Its Special Move is flaring up both of its arms, and knocking away the opponent (Burning Fist). It is shrouded in crimson flames over its entire body. 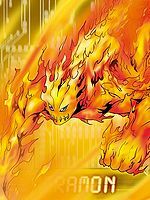 As a Digimon generated from the defensive "Firewall" which prevents illegal entries from the Internet and the like, it possesses a violent temperament like the flames that envelop its body, and tries to incinerate everything it touches. Its fire power is stronger than those of the same species on File Island, and taming this Digimon is extremely difficult. Even if it's tamed, there's no telling when it will bare its fangs. 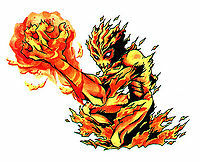 Its Special Move is flaring up both of its arms, and knocking away the opponent (Burning Fist). 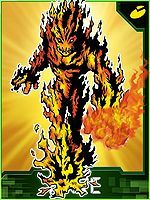 A Flame Digimon that is always burning and on fire. In battle, everything that touches it will be burnt. — Digimon Adventure: "Red Hot! 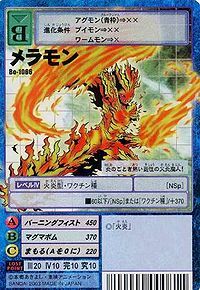 Birdramon"
It burns through everything with its flames and fiery temper. 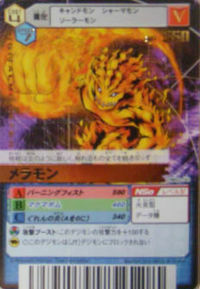 Its Special Move is Burning Fist. 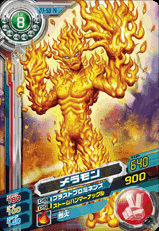 Flame type Digimon, Adult level. 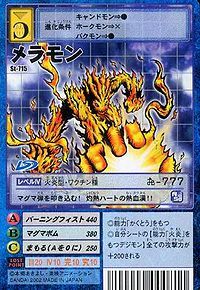 Its Special Move is Magma Bomb. — Digimon Tamers: "Enter the Digital World! Goodbye to Our City"
A Flame Digimon that is shrouded with crimson flames over its whole body. 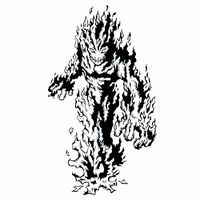 It possesses a violent temperament like the flames that wrap its body and tries to incinerate everything it touches. It is shrouded in crimson flames over its entire body. 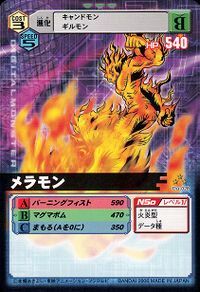 As a Digimon generated from the defensive "Firewall" which prevents illegal entries from the Internet and the like, it possesses a violent temperament like the flames that envelop its body, and tries to incinerate everything it touches. Its fire power is stronger than those of the same species on File Island, and taming this Digimon is extremely difficult. Even if it's tamed, there's no telling when it will bare its fangs. 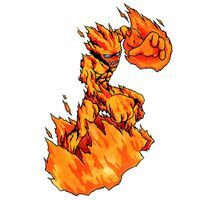 | Mera comes from meramera (「メラメラ」), meaning to burn. 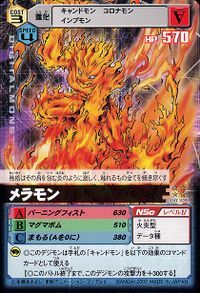 バーニングフィスト Bāningu Fisuto Burning Fist/Roaring Flame/Fireball Flares up its arms and either punches the opponent or throws one or more fireballs. 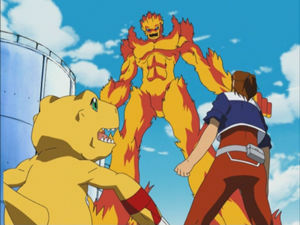 In Digimon Masters, flares up its entire body to burn the opponent. 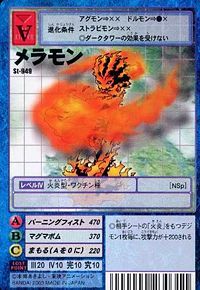 マグマボム Maguma Bomu Magma Bomb/Magma Blast Emits magma rocks that rain upon its opponents, or throws one large, explosive rock. Unleashes a wave of flames. Punches the enemy, sending heat through them. 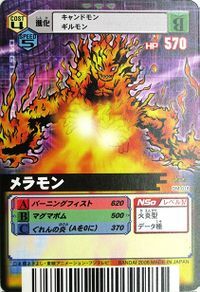 Guren no Honō  Crimson Flame ぐれんの炎 N/A Roaring Flame/Blazing Flames Shoots fireballs at the opponent. In DA04, a Meramon is under the control of a Black Gear and attacks the village of the Pyocomon. Piyomon evolves to Birdramon and destroys the Black Gear. Several Meramon controlled by Evil Rings appear in ZT09. They are knocked out by the runaway Skull Greymon. 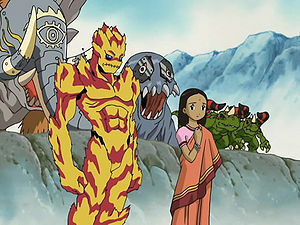 In ZT40, a Meramon appears as the partner of an Indian Chosen Child, Mina. A Meramon is the first Digimon the Tamers and their partners meet in the Digital World in DT25. Evolved from several Petit Meramon. Several Meramon and a Blue Meramon work for Death Meramon, the second-in command of Ancient Volcamon. Meramon appears as an obtainable Adult-level Data type Digimon in Digimon World. After you help out the Drimogemon in the Drill Tunnel, the Drimogemon will come across a big boulder that only your Digimon can push it away, reaching to the Lava Cave. At the deepest part of the Cave resides a Meramon that plans on erupting the volcano and destroying the File Island to end all sources of problems. However Meramon is halted by the Player and a battle starts. 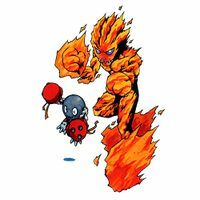 After Meramon is defeated it'll apologize for the trouble caused and will join the Village of Beginnings, working in the Restaurant, along with Tyranomon, Yukidarumon, Garurumon, Vademon and Digitamamon. If none of the aforementioned Digimon was recruited, Meramon will build the Restaurant. After Meramon is recruited, the blocked path to the Mount Panorama will now be open. Bonus conditions: Battle more than ten times and have at least 28 different techniques mastered. 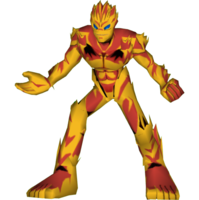 Meramon's Digivolution item is the Fireball which lets any Child Digimon evolve into Meramon. 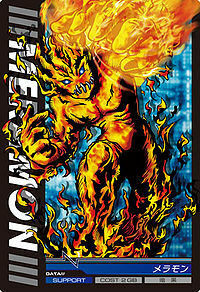 Meramon lits its hands with fire, then releases various fireballs towards the enemy. Meramon is an obtainable Digimon. Evolves from Candmon (3-5 DP) and can evolve to Blue Meramon (0-5 DP) or Death Meramon (6+ DP). 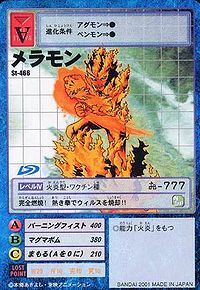 Meramon appears as an opponent and an obtainable Red Card. Meramon is an obtainable evolution of Agumon. Evolves from Candmon, Guilmon, Coronamon or Toy Agumon. 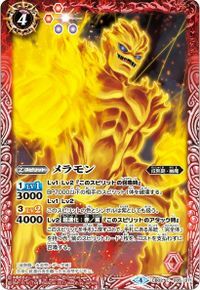 Can evolve to Death Meramon, Blue Meramon or Etemon. Meramon is an obtainable Digimon which is evolved from Candmon, Guilmon, Hagurumon, or Pico Devimon, and can evolve to Blue Meramon, Lady Devimon, or Vamdemon. It can also be obtained as a collectible card. Its card is part of the Twin Flame (ツインフレイム Tsuin Fureimu) set. Evolves from Agumon or Betamon. Can evolve to Mamemon. Evolves from Bakumon, Candmon or Pico Devimon. Can evolve to Death Meramon or be Jogressed with a compatible Digimon to get Were Garurumon, Pumpmon or Fantomon. Meramon is an enemy Digimon in Area 02 and 03. 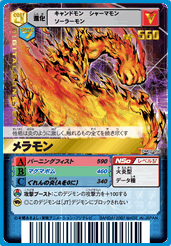 Evolves from Penmon, Dracumon, Hagurumon or Gizamon. Can evolve to Volcamon, Marin Devimon or Scorpiomon. Meramon is an enemy Digimon. Beware of the magma bullets it flings! This hot-blooded man sports a burning heart!! 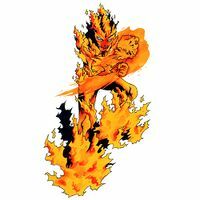 Its burning fist devastates everything! 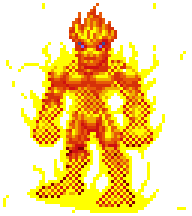 This flaming demon man has a temper as hot as fire! 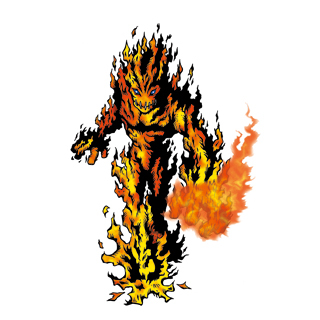 Its personality is as intense as the flames that cover its body, burning to a crisp all who come close. 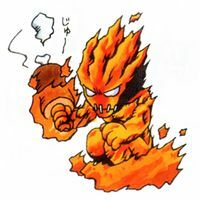 A Flame Digimon whose entire body is shrouded in crimson flames. Its personality is as intense as fire, and it burns to a crisp all that it touches. 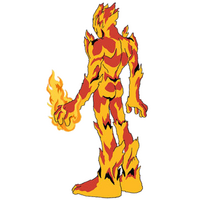 A Flame type Digimon whose whole body is covered in red hot flames. Although it usually has a docile personality, it is unstoppable once it becomes angry. 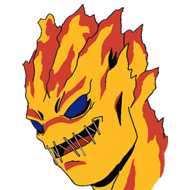 Born from the Firewall that protects the Internet, its entire body is wrapped in flames. 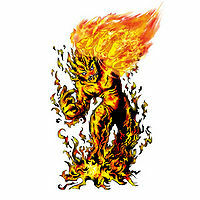 It has a temperament as fiery as the flames on its body, and seeks to raze everything to the ground. 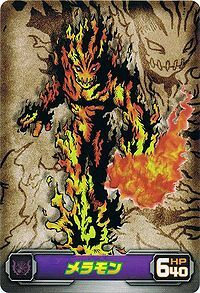 Meramon is an enemy Digimon in the Tactimon challenge. 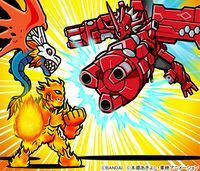 ↑ Digimon Xros Wars: "Dorulumon, Run Like the Wind!" This page was last modified on 19 November 2017, at 11:20.